Alfred A. Knopf, New York, 2009. 418 pages. 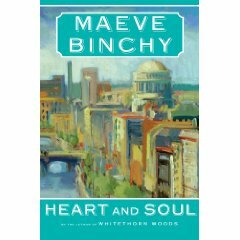 Maeve Binchy’s books are warm, friendly, and cozy. She specializes in telling stories about a community of people. In Heart and Soul, the community is a new heart clinic in Dublin. We look through windows into the lives of the people who come to work at the clinic, the patients, and others touched by them. To add to the fun, the author brings back old friends who played a part in her earlier books. You definitely don’t need to have read the earlier books to appreciate Heart and Soul, but it does make you feel that you are catching up with old friends. I found myself wishing that I had not missed her last book, Whitethorn Woods. I will definitely have to rectify that. In Maeve Binchy’s earlier books, there seemed to be a pattern that the more ideal the marriage seemed, the more sure you could be that it was doomed. These more recent books are gentler. People still have problems, but personally I’m glad that there are less dirty rotten cheating husbands than in some of her earlier books. Her characters cope with their problems with courage, compassion and resilience, and it’s delightful to spend time in the company of these people. There’s water buffalo who lives on the corner and points people in the right direction. There’s an exchange student who leaves a surprising gift. There’s a boyish expedition to the edge of the world. All the stories are told as if someone’s matter-of-factly telling something that happened to them, once. This is the sort of book you have to share. I found myself exclaiming over each story, so of course I got my teenage son to read it. Even that wasn’t enough, as I decided I had to share it with my other son, too, so this is his present for his twenty-first birthday. As The Arrival did, in many ways this book creates an entirely new category. Let’s see, I suppose you might call it illustrated science fiction short-short stories. I think I’ll just call it irresistible. Try it yourself — read one story and see if you aren’t too intrigued to stop. I love these new Peter and the Wolf wannabes! Like The Shoebird, The Composer Is Dead is a picture book story with orchestration. 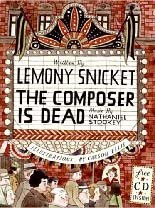 The accompanying CD is narrated by Lemony Snicket himself. The story is fun, though not particularly captivating. However, it does serve to introduce the instruments of the orchestra, and I did find the accompanying music beautiful. The composer is dead. All the instrumental sections of the orchestra are suspects, but they have a wide variety of alibis. A lot of generalities are given about the instruments, which are sometimes fun and sometimes simply stereotypical. The Violins answered first, of course. The violin section is divided into First Violins, who have the trickier parts to play, and the Second Violins, who are more fun at parties. The tuba said, “I’m a confirmed bachelor. I was home all night playing cards with my landlady, the Harp, taking sips of warm milk from a little blue cup.” The accompanying tuba and harp duet was particularly beautiful. I thought the closing was a bit lame — that orchestras have murdered composers for years, so this is no different. So the mystery in the book falls rather flat. As with The Shoebird, this adds some nice variety to ways you can teach kids about the orchestra. This one had nicer music and a story that helps listeners notice the differences between the types of instruments. I don’t think it’s time to throw away Peter and the Wolf yet, but this is a nice addition to the Introduction-to-the-Orchestra repertoire. 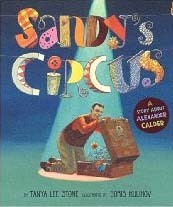 Arthur A. Levine Books (Scholastic), 2008. 395 pages. 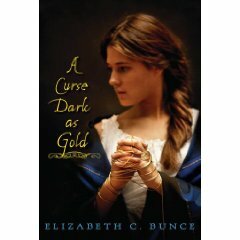 Winner of the William C. Morris YA Debut Award 2008. I do love fairy tale retellings. A Curse as Dark as Gold takes the basic story of Rumpelstiltskin and sets it in a woolen mill shortly before the Industrial Revolution. The author retains the feeling of magic and romance, and gives us a determined and strong heroine. When Charlotte Miller’s father dies, leaving an enormous mortgage on the mill, Charlotte knows she must do something to keep Stirwaters running. The entire village depends on the mill for their livelihoods. But everyone says there’s a curse on the mill, and as soon as Charlotte and her sister Rosie overcome one seemingly insurmountable obstacle, another one rises up to take its place. So when a strange man who calls himself Jack Spinner offers to help, Charlotte seems to have no choice. This story is dark, as it does involve curses and difficulties. But Charlotte is such a determined, capable character, you quickly find yourself rooting for her to succeed, even though you can’t imagine how she’ll pull it off. The author fills the story with details about the woolen industry before the industrial revolution, so it almost feels more like a historical novel than a fantasy. However, there is a strong undercurrent of magic, which practical Charlotte does not want to acknowledge. This is a magnificently written book, and I’m excited to learn it’s Elizabeth Bunce’s first. If this is how she begins her writing career, I will eagerly wait to see what she writes next! A Paula Wiseman Book (Simon & Schuster Books for Young Readers), New York, 2008. 42 pages. Here’s an alphabet book for adults! Or teens. Or children. 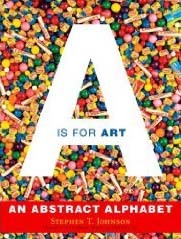 A Is For Art is amazing and thought-provoking and clever and playful all at once. “For the past six years I have been exploring the English dictionary, selectively choosing and organizing particular words from each letter of the alphabet and, based solely on the meanings of the words, developing a visual work of art. I took ordinary objects and made them unfamiliar, removing functionality in order to reveal their potential metaphorical associations, which can lead in turn to overlapping and sometimes paradoxical meanings. I call these individual works ‘literal abstractions’ and the ongoing series An Abstract Alphabet…. “And just for fun, I have included the letter shapes of each letter of the alphabet in all the works. Well, most anyway — you’ll see. This book, left around, will pull people into delighted browsing. Atheneum Books for Young Readers, New York, 2007. 208 pages. Here’s the novelized story of Annie Sullivan, Helen Keller’s teacher. Sarah Miller does a magnificent job making us feel what it must have been like for a poor orphan to come miles to teach a spoiled, passionate blind and deaf child, who showed an ability for clever imitation, but didn’t show glimmers of understanding. Annie taught Helen discipline, and then gave her the power of words. But she might never have persevered if she hadn’t been a spitfire herself. This book carries the reader into a compelling piece of history, and gives us a window into the mind of someone whose sheer stubbornness was responsible for a miracle. But how amazing that she didn’t give up before that wonderful day came! 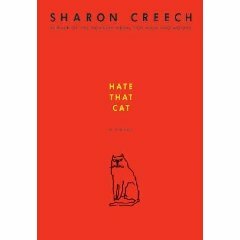 Here’s another delightful picture book biography. It gives you a feel for what the artist has done and makes you want to know more. The story is told on a level that will intrigue both children and adults. I especially enjoy the playful illustrations. Tanya Lee Stone and Boris Kulikov beautifully capture the inventive, experimental quality of Sandy Calder’s art. They show how he playfully created a moving, working circus out of wire. His art was more than a static display to look at. It was a show where things happened. The author tells us that “even the mobiles that hang over baby cribs would not exist without Calder.” This is the story of a man who brought a sense of play into his life’s work. See her hands in the air waving here waving there! This book doesn’t take long to read, but it will inspire even an adult reader to look at poetry in a new way. Waterbrook Press, 2001. 218 pages. Using the Biblical story of Naomi, in Shattered Dreams, Larry Crabb talks about how sometimes God’s best for us comes through the destruction of all our hopes. Sometimes our deepest, truest dream can only happen when our superficial dreams are shattered. “The highest dream we could ever dream, the wish that if granted would make us happier than any other blessing, is to know God, to actually experience Him. The problem is that we don’t believe this idea is true. We assent to it in our heads. But we don’t feel it in our hearts. I thought of this book as an excellent reminder. I didn’t feel like the author was saying anything brand new, but it was good to hear someone giving voice to the truth that God can work through our pain. Through difficult times, we can learn to desire God — and find Him — as at no other time in our lives. Adams Media Corporation, Second Edition, 1996. 218 pages. Being blamed for the battering of her own spirit is the line that resonated with me. As if it’s not bad enough to be told that one is a terrible person, reality is twisted so that if she protests, now she’s told she’s someone who’s always fighting, a terrible, argumentative person. “Extraordinary self-esteem is precisely what is required to recognize that her mate is in another reality — that he sees the world through the model of Power Over. “Don’t spend a second trying to explain that you weren’t doing what you were accused of doing or guilty of what you were blamed for. Just say, ‘Stop it.’ Abusive statements are lies about you which are told to you. They violate your boundaries. The abuser in effect invades your mind, makes up a ‘story’ about your motives, and then tells it to you. No human being has the right to do that to another. “Generally, accusing and blaming involve lies about the partner’s intentions, attitudes, and motives. They leave her feeling frustrated and misunderstood and, therefore, especially desirous of explaining herself. If she does try to explain herself, the abuse is perpetuated. I am not the cause of another’s irritation, anger, or rage. 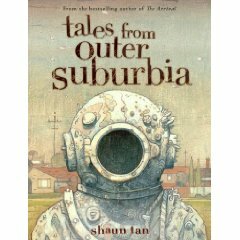 You are currently browsing the Sonderbooks blog archives for March, 2009.